LONG BEACH, Calif., May 2, 2018 – Attendees at this week’s Advanced Clean Transportation (ACT) Expo are seeing Kenworth trucks incorporating the latest green emission technologies designed to help fleets and truck operators address requirements for emission reduction. Leading the way in Kenworth’s booth (No. 939 in Exhibit Hall A) are two special Kenworth T680 day cabs. The first T680 is called HECT (Hybrid Electric Cargo Transport), and the second T680 is ZECT (Zero Emission Cargo Transport). Both the T680 HECT and T680 ZECT projects are funded in part by the Office of Energy Efficiency and Renewable Energy (EERE), the U.S. Department of Energy and the South Coast Air Quality Management District. The T680 HECT tractor, which is making its public debut at ACT Expo, incorporates a parallel hybrid electric propulsion system that uses the Cummins Westport ISL G Near Zero (NZ) emission engine fueled by compressed natural gas (CNG), in combination with a generator to extend the truck’s battery range. The truck has a 30-mile zero emissions range using electricity stored in the onboard lithium-ion batteries. When the batteries are depleted, the near-zero emission engine turns on to generate more energy and extend the truck’s range up to 250 miles. 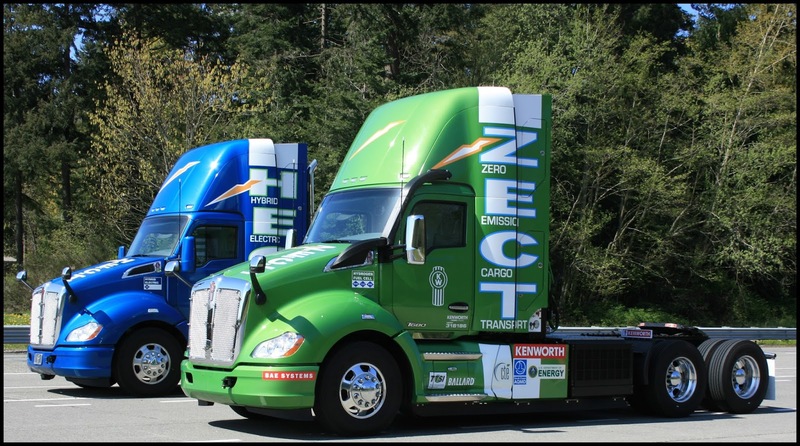 Both the T680 HECT and T680 ZECT are in development and testing, with field trials scheduled to begin later this year with Total Transportation Services Inc. (TTSI) at the Ports of Los Angeles and Long Beach. Two other vehicles are on exhibit in Kenworth’s booth at ACT Expo. During a ceremony Tuesday at ACT Expo, a special Kenworth T680 day cab with the first Cummins Westport ISX12N near-zero natural gas engine going into service was presented to AJR Trucking based in Rancho Dominguez, California. The T680 features the 12-liter engine rated at 400-hp and fueled by compressed natural gas (CNG), and is in the Kenworth booth during the show. According to Cummins Westport, the new engine has the lowest certified ultra low NOx emission in North America – 90 percent lower than current North American EPA standards. Also displayed is a Kenworth T680 specified with the Cummins Westport ISX 12 G natural gas engine. The 12-liter, 400-hp natural gas engine operates on CNG, and is available for both the T680 and T880. The truck features the Worthington Industries natural gas fuel and tank system.